How many Americans have actually bothered to read the Constitution, let alone the first ten amendments to the Constitution, the Bill of Rights (a quick read at 462 words)? Take a few minutes and read those words for yourself—rather than having some court or politician translate them for you—and you will be under no illusion about where to draw the line when it comes to speaking your mind, criticizing your government, defending what is yours, doing whatever you want on your own property, and keeping the government’s nose out of your private affairs. Compare the following list of “don’ts” the government is prohibited from doing with the growing list of abuses to which “we the people” are subjected on a daily basis, and you will find that we have reached a state of crisis wherein the government is routinely breaking the law and violating its contractual obligations. For instance, the government is NOT allowed to restrict free speech, press, assembly or the citizenry’s ability to protest and correct government wrongdoing. Nevertheless, the government continues to prosecute whistleblowers, persecute journalists, cage protesters, criminalize expressive activities, crack down on large gatherings of citizens mobilizing to voice their discontent with government policies, and insulate itself and its agents from any charges of wrongdoing (or what the courts refer to as “qualified immunity”). The government may NOT infringe on a citizen’s right to defend himself. Nevertheless, in many states, it’s against the law to carry a concealed weapon (gun, knife or even pepper spray), and the average citizen is permitted little self-defense against militarized police officers who shoot first and ask questions later. The government may NOT enter or occupy a citizen’s house without his consent (the quartering of soldiers). 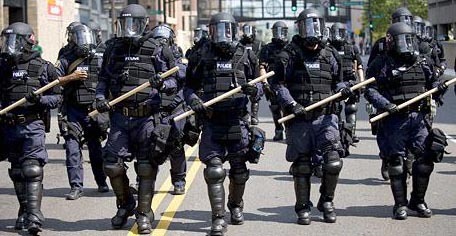 Nevertheless, government soldiers (i.e., militarized police) carry out more than 80,000 no-knock raids on private homes every year, while maiming children, killing dogs and shooting citizens. The government may NOT carry out unreasonable searches and seizures on the citizenry or their possessions. NOR can government officials issue warrants without some evidence of wrongdoing (probable cause). Unfortunately, what is unreasonable to the average American is completely reasonable to a government agent, for whom the ends justify the means. In such a climate, we have no protection against roadside strip searches, blood draws, DNA collection, SWAT team raids, surveillance or any other privacy-stripping indignity to which the government chooses to subject us. The government is NOT to deprive anyone of life, liberty or property without due process. Nevertheless, the government continues to incarcerate tens of thousands of Americans whose greatest crime is being poor and brown-skinned. The same goes for those who are put to death, some erroneously, by a system weighted in favor of class and wealth. The government may NOT take private property for public use without just compensation. Nevertheless, under the guise of the “greater public interest,” the government often hides behind eminent domain laws in order to allow megacorporations to tear down homes occupied by less prosperous citizens in order to build high-priced resorts and shopping malls. Government agents may NOT force a citizen to testify against himself. Yet what is the government’s extensive surveillance network that spies on all of our communications but a thinly veiled attempt at using our own words against us? The government is NOT allowed to impose excessive fines on the citizenry or inflict cruel and unusual punishments upon them. Nevertheless Americans are subjected to egregious fines and outrageous punishments for minor traffic violations, student tardiness and absence from school, and generally having the misfortune of being warm bodies capable of filling privatized, profit-driven jails. The government is NOT permitted to claim any powers that are not expressly granted to them by the Constitution. This prohibition has become downright laughable as the government continues to claim for itself every authority that serves to swell its coffers, cement its dominion, and expand its reach. Despite what some special interest groups have suggested to the contrary, the problems we’re experiencing today did not arise because the Constitution has outlived its usefulness or become irrelevant, nor will they be solved by a convention of states or a ratification of the Constitution. No, as I document in my new book Battlefield America: The War on the American People, the problem goes far deeper. It can be traced back to the point at which “we the people” were overthrown as the center of the government. As a result, our supremacy has been undone, our authority undermined, and our experiment in democratic self-governance left in ruins. No longer are we the rulers of this land. We have long since been deposed and dethroned, replaced by corporate figureheads with no regard for our sovereignty, no thought for our happiness, and no respect for our rights. In other words, without our say-so and lacking any mandate, the point of view of the Constitution has been shifted from “we the people” to “we the government.” Our taxpayer-funded employees—our appointed servants—have stopped looking upon us as their superiors and started viewing as their inferiors. Unfortunately, we’ve gotten so used to being dictated to by government agents, bureaucrats and militarized police alike that we’ve forgotten that WE are supposed to be the ones calling the shots and determining what is just, reasonable and necessary. Then again, we’re not the only ones guilty of forgetting that the government was established to serve us as well as obey us. Every branch of government, from the Executive to the Judicial and Legislative, seems to be suffering this same form of amnesia. Certainly, when government programs are interpreted from the government’s point of view (i.e., the courts and legislatures), there is little the government CANNOT do in its quest for power and control. We’ve been so brainwashed and indoctrinated into believing that the government is actually looking out for our best interests, when in fact the only compelling interesting driving government programs is maintain power and control by taking away our money and control. This vital truth, that the government exists for our benefit and operates at our behest, seems to have been lost in translation over two centuries dominated by government expansion, endless wars and centralized federal power. Have you ever wondered why the Constitution begins with those three words “we the people”? It was intended to be a powerful reminder that everything flows from the citizenry. We the people are the center of the government and the source of its power. That “we” is crucial because it reminds us that there is power and safety in numbers, provided we stand united. We can accomplish nothing alone. This is the underlying lesson of the Constitution, which outlines the duties and responsibilities of government. It was a mutual agreement formed by early Americans in order to ensure that when problems arose, they could address them together. It’s like the wagon trains of the Old West, comprised of individual groups of pioneers. They rarely ventured out alone but instead traveled as convoys. And when faced with a threat, these early Americans formed their wagons into a tight circle in order to defend against invaders. In doing so, they presented a unified front and provided protection against an outside attack. In much the same way, the Constitution was intended to work as an institutionalized version of the wagon circle, serving as a communal shield against those who would harm us. Unfortunately, we have been ousted from that protected circle, left to fend for ourselves in the wilderness that is the American frontier today. Those who did the ousting—the courts, the politicians, and the corporations—have since replaced us with yes-men, shills who dance to the tune of an elite ruling class. In doing so, they have set themselves as the central source of power and the arbiters of what is just and reasonable. Once again we’re forced to navigate hostile terrain, unsure of how to protect ourselves and our loved ones from militarized police, weaponized drones, fusion centers, Stingray devices, SWAT team raids, the ongoing military drills on American soil, the government stockpiling of ammunition, the erection of mass detention centers across the country, and all other manner of abuses. Read the smoke signals, and the warning is clear: It’s time to circle the wagons, folks. The government is on the warpath, and if we are to have any hope of surviving whatever is coming at us, we’ll need to keep our wits about us and present a unified front. Most of all, we need to restore “we the people” to our rightful place at the center of government. How we do that depends largely on each community’s willingness to get past their partisan politics and blind allegiance to uniformed government officials and find common ground. To put it a little more bluntly, stop thinking like mindless government robots and start acting like a powerhouse of citizens vested with the power to say “enough is enough.” We have the numbers to stand our ground. Now we just need the will. This post which says it all about us and what needs to be done has been setting out there for 4 hours, I am the first to punch the like, make a comment or reblog. That is a disgusting shame. It is WAY past enough! Lets get the wagons, I am ready! And though it happened 7 1/2 hours later than my friend in St. Louis…I’m the second. Very important piece and very accurate! Thank you for bringing it to me! No person alive has ever been offered or accepted a contract from the government to be ruled.